※ The Great Lakes are the largest expanse of freshwater in the world. ※ The Great Lakes are in the midst of a slow-motion ecological catastrophe begun by opening to the St. Lawrence Seaway and the Atlantic. ※ Freshwater is the world's most precious natural resource. After the last election I became laser-focused on Wisconsin. I watched as a traditionally blue state voted red, and kept Governor Scott Walker and Speaker of the House Paul Ryan in office through severe gerrymandering that could not be reversed even by mandate from federal judges. The Wisconsin gerrymandering case was forced to our country’s highest court, and SCOTUS's decision on the fairness of such twisted districts should be heard before the November 2018 election. But decisions made by the severely gerrymandered Republican legislature has been allowed to impact and will continue to impact Lake Michigan’s watershed at a time when it needs urgent attention. A proposed $10 billion investment in Paul Ryan's District #1 by Taiwan's Foxconn, maker of touch screens for the iPad, was inked in 2017. Foxconn will use 7 billion gallons of water from Lake Michigan per day, five billion of which will be used outside and not returned to the lake's watershed area. By the end of Egan's book, contracts like this and that made with Waukesha city, a suburb of Milwaukee also outside the watershed area, take on far greater meaning. Lake Michigan and the rest of the Great Lakes have been under pressure from invasive species through the Seaway to the north and from the south through the Sanitary & Ship Canal to the Mississippi. Just when scientists managed to tackle the problems caused by one devastating species, they would encounter another, even more overwhelming, until we arrived where we are now, with toxic algae blooms regularly threatening the water supplies of major cities that use lake water for drinking water. Besides that, we discover the increases in the lake’s winter temperatures means increases in the lake’s summer temperatures, encouraging evaporation and shrinkage of water area. This, along with pollution of existing supplies and inevitable demands from rapidly drying areas of the country who have gone through their aquifers is increasing the pressures on scientists to refresh and preserve this enormously important natural resource. It requires attention and political support, and one fears what would happen should business-influenced politicians force through compromises that have short-term gains for the few and long term consequences for the many. Dan Egan is a reporter at the Milwaukee Journal Sentinel and has been researching and reporting on the Great Lakes for at least a decade. He has done something we rarely encounter: he has made science and history come alive. 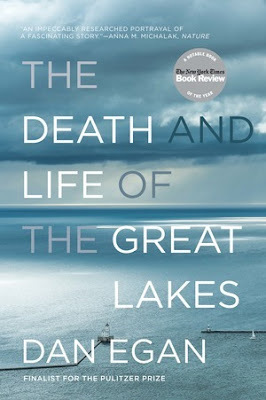 As I did my own research into the political conditions in Wisconsin, I thought it would be important to learn more about Lake Michigan which plays such an important role in the life and economy of the state but I expected Egan’s book would be struggle to read. Instead I found it completely riveting and hard to put down. When was the last time you said that about a science/geography/history book? A few years ago I read another nonfiction title, Boys in the Boat, by Daniel James Brown that was similarly involving. Although the history of the Washington crew team competing in the 1936 Olympics in Hitler’s Germany is long over, Brown made the book completely propulsive and un-put-down-able. That is the way I feel about Egan's book. One threat to the lakes follows another, and our hearts squeeze as we hear of dangers and disasters in the last couple of years. It feels absolutely critical that we pay attention to the resource--fresh water--scientists have been telling us for half a century is in limited supply and which has everything to do with life on earth. I can’t recommend this title more highly. Egan should definitely be on award lists for this title, and indeed has already scooped a couple. The W.W. Norton paperback came out last month (April 2018) and the Random House Audio production is likewise terrific, narrated by Jason Culp. Below please find a clip.